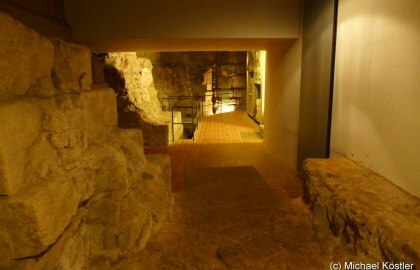 The entrance to the underground Excavations Museum is situated next to the west portal of the Parish Church of St. Dionysius at the Market Square. It was here that the foundations of the oldest church from the 8th century were uncovered, together with those of a replacement built about 100 years later. A visit to the museum leads back to the beginnings of the old Imperial City when, in the Franconian Empire more than 1200 years ago, a town developed out of the village. The first documented evidence in the year 777 is related to the first church: Fulrad, the Abbot of the Franconian monastery of St. Denis near Paris, mentioned it in his will. The excavations can be visited every Thursday and Sunday at 3pm.